Sir Hook's excellent post yesterday reminded me of my youth and, more specifically: Candy! It was on this day (December 5th) that we would decorate plates or bowls (and maybe even our empty, stinky shoes) in anticipation of St. Nicholas coming. The next morning the empty vessels would be magically full of hard candy. St. Nicolas Day is how I remember the Christmas Season really starting (That, and the day the GIANT Sears Toy Catalog arrived). 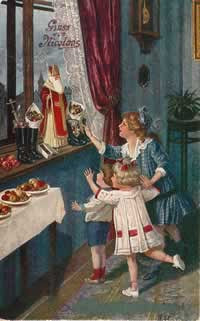 St. Nicholas day is celebrated all over the world in a lot of unique ways. 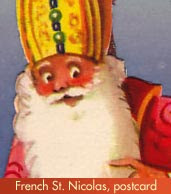 Here in the States, Bishop St. Nicholas is celebrated by many churches and by communities which have a Dutch heritage. On the Advent Sunday closest to St. Nicholas Day, December 6, some churches have St. Nicholas festivals, large or small, with the good saint himself appearing to greet children, give instruction and encouragement, and hand out treats for children of all ages. In some places he is a focus in worship and in others he is part of a special fellowship event. 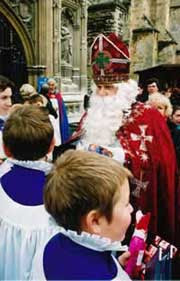 England has nearly 500 Anglican churches named for St. Nicholas. These parishes and cathedrals mark their patron saint's feast day with a special Patronal Feast. As St. Nicholas Day is in early Advent and he is associated with children and gifts, many churches invite the saint to visit during, or after, the Sunday service, to explain who he is and what it means to celebrate his memory today. (Some churches do observe the day properly on the 6th rather than on the closest Sunday because each Advent Sunday has its own important theme.) On this day the homily reflects St Nicholas' true identity, as opposed to the more commercial Father Christmas or Santa. There is also a time for collecting food, gifts, and money for the less financially privileged. In a Caribbean celebration with origins in the Netherlands, the Dutch Sinterklaas sails into harbor from Spain in mid-November, with his white horse and an entourage of Zwarte Piet helpers. (Though in Curaçao, the "horse" is a white Ford Mustang!) Families gather in a festive spirit to greet their arrival. A parade follows with the good saint and his helpers throwing pepernoten to the children. 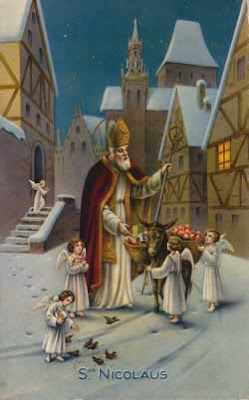 On St. Nicholas Eve, 5 December, children put a bucket of water and a shoe filled with hay or a carrot outside for the saint's big white horse. If they have been good, the shoes will be filled with gifts by morning. If they haven't been good, Zwarte Piet just might pop them into a large sack and carry them back to Spain. During the evening gifts are exchanged in the Dutch way by wrapping them in elaborate disguises and presented with a humerous poem about the recipient. So, what's the difference between St. Nicholas and Santa Claus? Everybody loves Santa Claus. He embodies holiday cheer, happiness, fun, and gifts—warm happy aspects of the Christmas season. How do Santa Claus and St. Nicholas differ? P.S. I wonder if we Knights put out empty beer bottles is St. Nicholas would magically fill them up for us? Wonderful post! St. John's has St. Nicholas (ie: some parishioner dressed up as) appear on the Sunday closet to the 6th to greet the children after Mass. I like the idea of the white Mustang filled with empty beer bottles to be filled up by good ole' St. Nick. Consider the Feast Day added! Saturday was spent in St. Charles, Missouri with two good friends and Lady Amy and Lady LucyAnne...there was a parade led by the Lewis and Clark Fife and Drum Corps, followed by carolers and Santas from around the World complete with costumes, flags, and stories told in appropriate accents! After a day of shopping and eating, darkness fell. Las Prosadas Procession began as Mary and Joseph began their search for a place for the night. Mary riding on a donkey and Joseph beside her, followed by goats and sheep. After many stops, they were directed to a stable. This is an amazing event as Mary and Joseph travel, the spectators holding candles fall into line behind them as literally hundreds of people walk to the manger scene. There is the Christmas story before us, along with carolers in costume holding candle lanterns. The Yule Log was lit and a huge bonfire burned brightly to warm us as we sang the carols. As we walked back to the park, along the Missouri River, hearing the music play as the ice skaters swirled in the makeshift ice rink, there was a feeling of Christmas.